Happy Birthday Scot! A few days ago. I made this cake for him. As I have mentioned, Scot loves chocolate. Not only does he love chocolate, but he sometimes forgets that desserts without chocolate are still desserts. Good thing I am around. But still, it is his birthday, so I knew I needed to find the most ridiculous chocolate cake. In the past, I have made several different chocolate cake recipes. 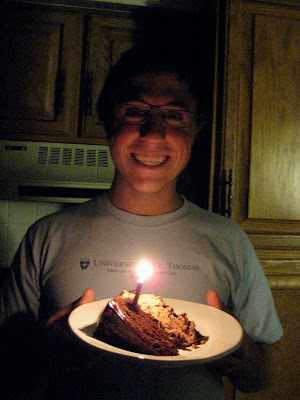 One birthday I made him a yellow cake with chocolate frosting. He almost had a heart attack until he realized how good yellow cake with chocolate frosting was. This year, I did find the most ridiculous chocolate cake. This cake has a brownie base layer. On top of that, a layer of chocolate mousse. Then, a layer of chocolate cake. Frosted with chocolate ganache. I was scared of this cake. For a few reasons. First, I was afraid I would mess it up. And I made it after work one day and as you can see...it isn't that quick. But, honestly, it wasn't that hard to make. Minus the six hours. Second, I was afraid I wouldn't like it. The other people who have made this mentioned it has over two pounds of chocolate in it. I didn't know if I could handle it. But, I really liked it. 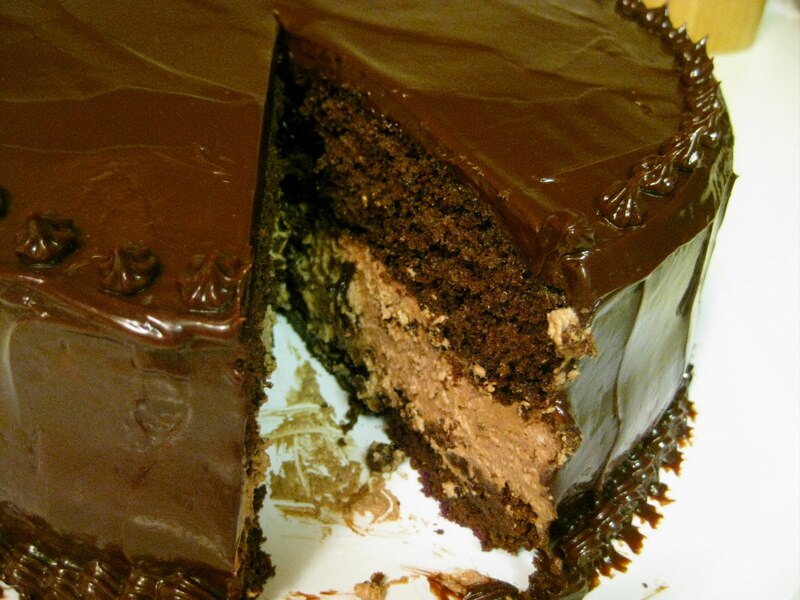 So, I would like to argue that this cake is not JUST for chocoholics. Since it has so many different types and textures of chocolate, I really enjoyed it. And I love mousse. The mousse and brownie did it for me. This was my first attempt at piping. I finally bought a piping bag and tips. I figured it was time. And it was way fun. Definitely not perfect but a good effort. Scot really liked it. He also liked licking the many bowls, spoons, attachments, etc. as I made this over the course of the night. By about 11:30 pm, when it was ready, he kind of regretted that. But he still ate a piece like a champ. You can always count on him for these types of things. To make the brownie base, line the bottom of a 9-inch springform pan with a round of parchment paper and spray the sides with nonstick cooking spray. Center a rack in the oven and preheat to 325 degrees F. In a medium bowl, combine the cake flour, salt and baking powder. Stir with a fork to mix. Melt the chocolate and butter in a large heatproof bowl set over a saucepan of almost simmering water, stirring occasionally, until smooth. When the chocolate mixture is completely smooth, remove the bowl from the saucepan and gradually whisk in the sugar. Add the eggs one at a time, whisking after each addition until thoroughly combined. Whisk in vanilla. Add in the flour mixture in two additions, folding with a rubber spatula until completely homogenous. Transfer the batter to the prepared pan and smooth with a spatula. Set aside, prepare the cake batter, and bake the two layers at the same time. To make the cake, line the bottom of a 9-inch round cake pan with a round of parchment paper. Grease and flour the sides of the pan. Combine the chocolate, cocoa and hot water in a medium heatproof bowl; set the bowl over a saucepan containing 1-inch of simmering water and stir with a rubber spatula until chocolate is melted, about 2 minutes. (Note: at this point, my mixture was pretty thick and I thought I had ruined it, but mixing in the sugar was like magic and it made it smooth and liquidy again.) Add 1/4 cup of sugar to the chocolate mixture and stir until thick and glossy, 1 to 2 minutes. Remove bowl from heat and set aside to cool. Whisk flour, baking soda and salt in a medium bowl; set aside. Combine buttermilk and vanilla in a small bowl. In the bowl of a stand mixer fitted with the whisk attachment, whisk the eggs and yolks on medium-low speed until combined, about 10 seconds. Add remaining sugar, increase speed to high, and whisk until fluffy and lightened in color, 2 to 3 minutes. Replace whisk with paddle attachment. Add the cooled chocolate mixture to the egg/sugar mixture and mix on medium speed until thoroughly incorporated, 30-45 seconds, pausing to scrape down sides of bowl with rubber spatula as needed. Add softened butter one tablespoon at a time, mixing about 10 seconds after each addition. Add about one third of the flour mixture followed by half of the buttermilk mixture, mixing until incorporated after each addition (about 15 seconds). Repeat using half of remaining flour mixture and all of remaining buttermilk mixture (batter may appear separated). Scrape down the sides of the bowl and add remaining flour mixture; mix at medium-low speed until batter is thoroughly combined, about 15 seconds. Remove bowl from mixer and fold batter once or twice with rubber spatula to incorporate any remaining flour. Pour into prepared pan; smooth batter to edges of pan with an offset spatula. Bake the brownie and cake layers at the same time: the brownie for 25-30 minutes and the cake for 30 minutes, or until a toothpick inserted in the center of each comes out clean. Transfer the pans to a wire cooling rack. Allow the brownie to cool completely in the pan. Allow the cake to cool in the pan for 15 minutes, then invert onto the wire rack and allow to cool completely. Once the brownie layer has cooled, run a knife around the edges to separate it from the pan. Remove the sides of the springform but leave the brownie layer on the springform base. Form a ring of parchment paper around the brownie layer and extending up the sides of the springform pan – reclose the springform so that the parchment is fitted tightly to the sides. To make the chocolate mousse filling, place a stand mixer bowl and whisk attachment in the freezer or fridge. Heat 1-inch of water in the bottom half of a double boiler over medium heat. Place the semisweet chocolate in the top half of the double boiler. Tightly cover the top with plastic wrap and allow to heat for 8- 10 minutes. Remove from the heat and stir until smooth. Transfer the melted chocolate to a stainless steel bowl and set aside until needed. Place heavy cream and sugar in the well-chilled bowl of an electric mixer fitted with the chilled whisk attachment. Whisk on high speed until stiff peaks form, about 1 1/2 minutes. Remove the bowl from the mixer. By hand, whisk to combine 1/4 of the whipped cream into the melted chocolate until smooth and completely incorporated. Add the combined whipped cream and chocolate to the remaining whipped cream and use a rubber spatula to fold together. Spread the mousse over the top of the brownie base evenly. Use an offset spatula to smooth the top. Place the cooled cake round over the mousse, pressing down lightly. Chill for at least 1 hour. To make the ganache, heat the heavy cream and the butter in a saucepan over medium high heat. Bring to a boil. Place the semisweet chocolate in a 3-quart stainless steel bowl. Pour the boiling cream over the chocolate and allow to stand for 5 minutes. Stir until smooth. Chill 1 cup of ganache for 1 hour. Allow the remaining ganache to come to room temperature (about 40 minutes). Remove the springform ring and parchment collar from the assembled cake. Carefully transfer the cake to a serving platter, removing the springform base and parchment round. 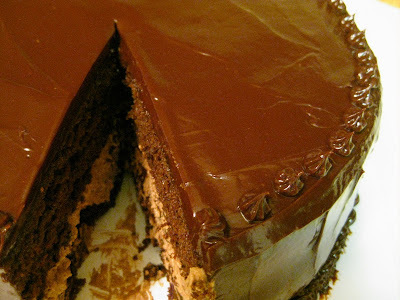 Use a spatula to smooth the room temperature ganache over the cake top and sides, covering evenly. 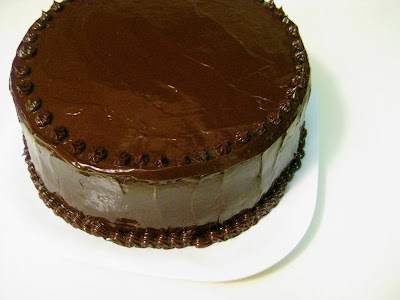 Place the chilled ganache in a pastry bag fitted with a shell tip and pipe a shell border around the base of the cake. Pipe 12-16 rosettes around the top of the cake to indicate servings. Serve chilled and store leftovers in the fridge. Cut the cake with a hot, dry knife. 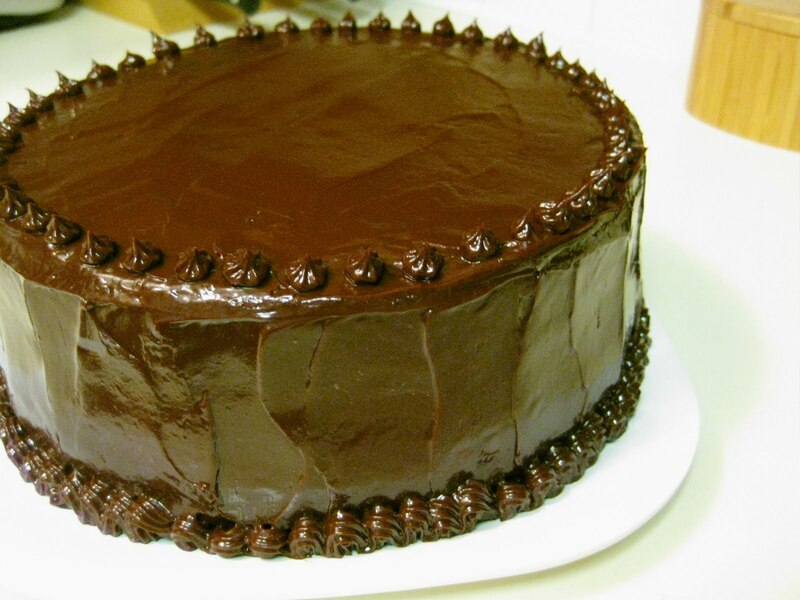 What an amazing looking chocolate cake!